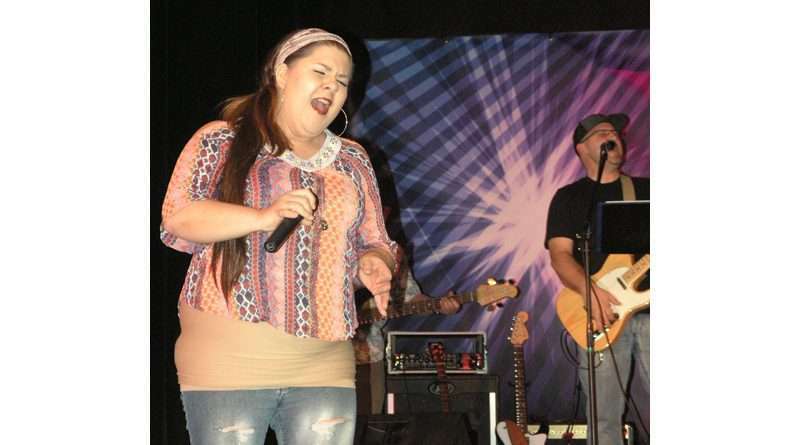 Main Street was rocking with echoes of The Live Edition Rock Band Concert escaping from the Veterans Hall last weekend. With an atmosphere reminiscent of a barn dance, the casual environment elicited audience participation with adults dancing, clapping and yes, even creating a light show with their cell phones. And, at one point a Conga line of nearly 20 people formed, snaking in and out of the crowd. Meanwhile, tiny tots with toes twinkling like fireflies from light-up sneakers twisted, turned, bounced and boogied their way across any available square footage. 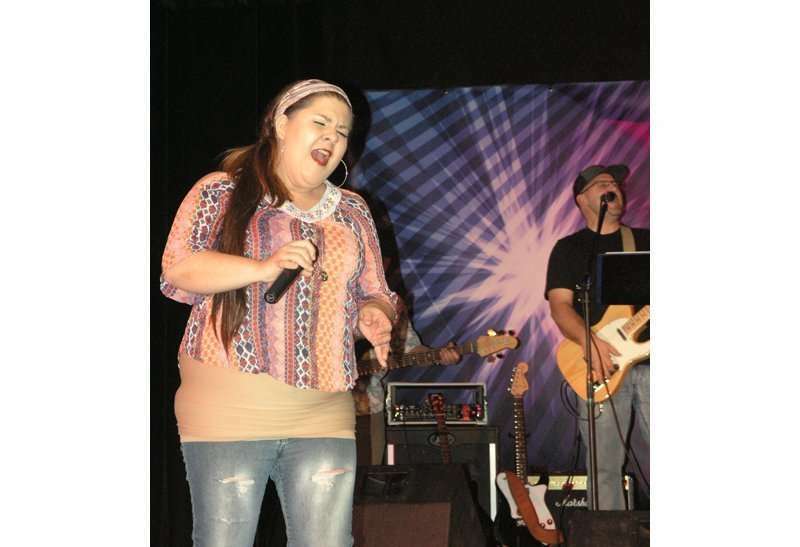 Angela House performs “Dancing in the Street” and “Takin’ Care of Business” during the recent concert. Forgery— with Jeremy Couso’s impressive lead vocals — gave us two solid hours of classic rock and roll — along with band members Justin Vetter, Tomm Williams, Keith Coker, and Adam Skillin. Lisa Bernard and Gwenna MacDonald provided back-up vocals. Bernard, production manager and head director of Best of Broadway, expressed gratitude for community support and turn out for the fundraiser. “This is the fifth year we have put this on. We use the proceeds to maintain systems such as sound and lighting. Recently, we were able to purchase a stage extension. This year we need to replace the large lighting board,” she said. With so many stand-out performers, it is difficult to do justice to all of them. Still, a particularly memorable, goose-bump inducing performance by Emily Bernard of “Signed, Sealed, Delivered, I’m Yours” must be noted as a highlight of the evening. Also, Jessica Scrogin really was “Some Kind of Wonderful” with her rendition of the same-said number, while Jimi Sturgeon Smith chose “Spooky” to showcase her powerful voice. 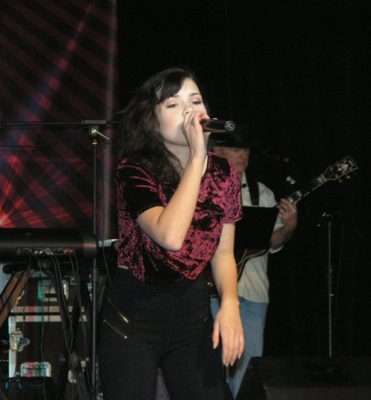 D’Arcy Ehrlich owned the stage with “Won’t Back Down” and “Runaway.” Ehrlich looked completely at ease, although it was only her second stint with Rock Band: The Live Edition. Tyler Harmon brought his very own fan club, which raised a ruckus every time his crop of blonde hair popped up on stage. When he sang “Free Fallin” and “I Know I’m Not the Only One,” the Fangirls swooned. Performances by Angela House included “Dancing in the Street” and “Takin’ Care of Business.” Her stage presence is always impressive, plus, she can really sing — the girl is good. Shawn Anderson worked the crowd and got everyone on their feet with “Sweet Home Alabama,” “Brown Eyed Girl” and “Roadhouse Blues” and looked right at home doing it. We were given a sneak preview of Best of Broadway’s 2019 cast of talent when an ensemble belted out “Seasons of Love” to the delight of the crowd. The song was a timely reminder of why patrons of the arts were gathered and that Best of Broadway season is just around the corner..